Earlier this week, the Harvard Business Blog published a short article about the six social media trends for 2010. One of the featured trends states that ‘sharing no longer means email’. (the other 5 can be found at http://blogs.harvardbusiness.org). What this means is that virtually every website, and almost all information on the web, will need the ability to be easily shared by readers and visitors across their social graphs or social networks and connections. Each page or ‘chunk’ of information (whether that’s a video, a blog post, or a web page) will have associated links to share the information across Facebook, Twitter, and a myriad of other social platforms. You’ve probably noticed these links and icons showing up on the web sites you visit. However, it will become an absolute requirement to implement social bookmarking and sharing capabilities, and to make it very easy for your users to share the information they find on your website, in your email programs / eNewsletters, on Facebook, and in your blog (in addition to everywhere else you are putting information on the Web). But as there are literally thousands of options for sharing information, a number of questions arise, like which format to choose and how to go about implementing social sharing. When your site visitors create content based on your content, they are creating links back to your site/content. And in-bound links are very important to search engines when they are ranking and ordering search results pages. Another benefit is that your site visitors (your customers?) are telling people who are connected to them from a social networking perspective (people who trust them) that your product, service, organization, or brand is something they should, at a minimum, take a look at. You have the opportunity to have customers who create customers. And that referral is much more effective than almost any other form of advertising. 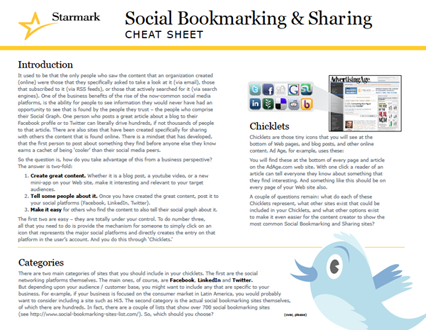 We have created a Social Bookmarking & Sharing Cheat Sheet that will answer some of the questions you may have. It is the first in a series of topics that we will be sending out periodically. 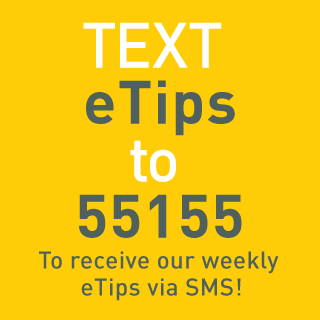 Oh, and, if you find it useful, please don’t forget to share it. You’ll find the links at the bottom of the second page.